Life presents you with many challenges. Meet those challenges, make mistakes and learn from them. Life presents you with moments of highs and lows, puts you through many situations. Learn to survive, to make the best out of them. Life is a dream, and it’s upto you if it’s a good one or maybe a haunting nightmare. Life has many aspects, seasons, faces. Celebrate each one with joy. Cherish each moment and treasure it in your heart forever, for you never know which one might be your last. Once it has gone it won’t be coming back. Stop living your life the past full of regrets, it’s gone now and stop worrying about the future, it is yet to come. Enjoy the moment, start living in the present because that’s who you are. Life brings you both tears of joy and pain, it brings you love and hate. Life is a short lived gift, it needs to be enjoyed and thanked for. 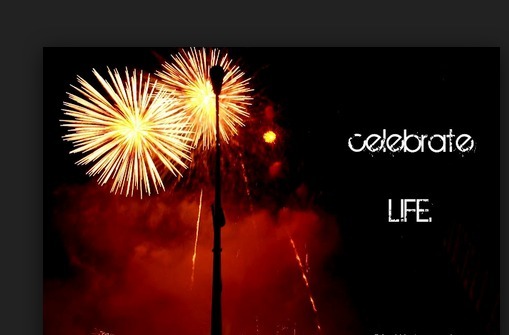 Life is a party, celebrate it while it lasts.